How do you determine the value of diamonds and jewelry? 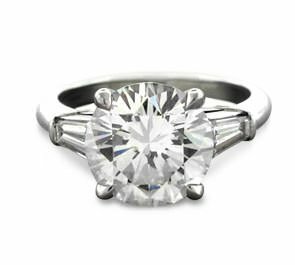 We examine every diamond or estate jewelry item individually, noting its content in precious metal, diamonds and gemstones. We look for reasons to pay you extra money for your diamond. When you sell diamonds, we will examine your jewelry for famous maker marks such as Tiffany or Rolex or other valuable provenance which would increase our offer. Being constantly in the marketplace enables us to determine both salability and value of your diamonds. Is there a cost for me to find out what you would offer? No. We are a consumer service as well as jewelry buyers. David and Steven welcome the opportunity to offer our expertise in hope of buying your jewelry. Naturally, if any items need to be returned, they will be returned fully insured at our expense. Do we pay retail value? That would not be realistic. Consumers – end users – always pay retail. We are a preliminary step in bringing valued jewelry items of all different periods into the market to be re-sold to consumers. While we do not pay retail, we offer the highest, competitive market prices for your diamond and estate jewelry. Sometimes these prices for your jewelry will be surprisingly high. We always seek luxury and brand name items such as Cartier, Tiffany & Co., Chopard, Van Cleef & Arpels, David Yurman, Bvlgari and Boucheron. Diamonds can certainly have a high resale value depending on the size and quality. We buy all types of gold coins. We also buy silver and platinum coins. Additionally, are also interested in currency, bullion and commemoratives coins of both USA and International types. Can we expect a higher price at an auction? Auctions certainly have their place, but consider the time you wait for an auction to be completed, as well as the substantial buyer and seller premiums for your jewelry which are deducted from your net proceeds. Often a seller ends up with less than an outright sale price fore their diamond and estate jewelry. When you sell diamonds, on rare occasions, an auction result might be unusually high, but one cannot depend on that rare chance. An auction usually needs to have your jewelry items three months before the auction takes place. If the diamond or estate jewelry item sells, you’ll have to wait yet another month to be paid. We offer and pay immediately. D. Atlas Estates began as a partnership within D. Atlas & Co., Inc, established 1898. This was a working business between David Atlas and Steven Schiffman. David Atlas became active in the trade back in the late 1960’s in his family’s estate jewelry business. Steven Schiffman became an estate jewelry entrepreneur and dealer in the mid-1970s. These two have traveled extensively both domestically and internationally to better understand the complex estate jewelry and diamond jewelry markets. While today their individual businesses are separately owned, their spirit of sharing their knowledge and cooperation with one another based on long term business remains. Sell Diamonds and Estate Jewelry with D. Atlas Estates. We offer free insured overnight shipping for your jewelry anywhere in the United States.